When I was a kid, I thought all cranberry sauce came out of a can in one big can-shaped jelly mold. I thought it tasted OK, but something about it was weird and unnatural. 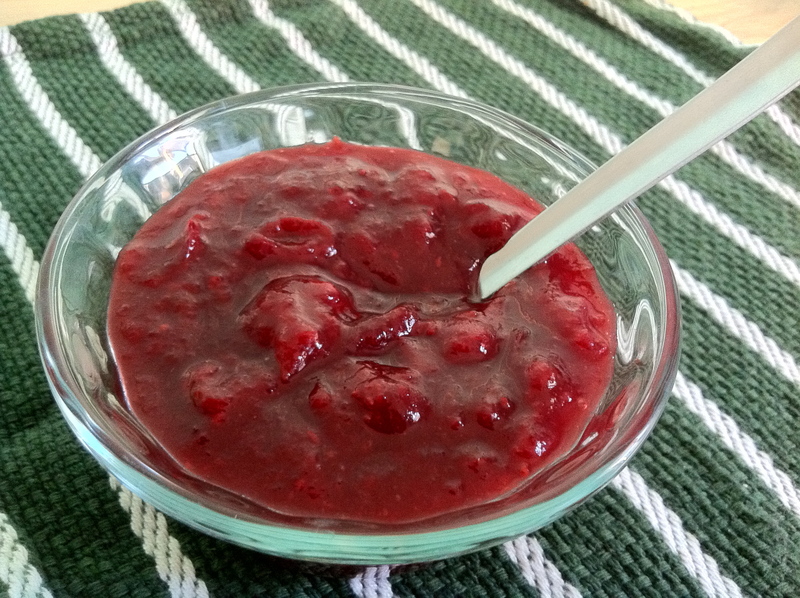 Then many years later I discovered that cranberry sauce could look like, well, sauce. And it tasted so…delicious. After that day, I just couldn’t bear to buy the jelly-roll-thing-in-a-can again. While homemade cranberry sauce does take longer to make than opening a can, I think it’s totally worth it. And my taste buds agree. If you’re in a real pinch, or simply will faint if you have to make one thing more thing for the holidays, you could add the spices to a store-bought can of whole cranberry sauce (please stay away from the jelly!). I promise not to say anything, as long as you pledge to try this recipe later. OK, now that we’ve done the pinkie swear thing….. This would be a great sauce to accompany any white meat, which you probably already guessed. But I encourage you to try it with other foods too, such as swirled into oatmeal or yogurt, dolloped onto vanilla ice cream, or stuffed into baking apples. I bet you could come up with some fun ways to use it for holiday hors d’oeuvres too. Pour water and sugar into medium pot and heat to a boil, stirring. Add cranberries and bring to boil again. Simmer, covered, until cranberries pop and mixture thickens a little (about 15-20 minutes). Turn off heat. Stir in rest of ingredients. Let sit until cools. Transfer sauce to glass container and chill in fridge until thickens (don’t worry, it will firm up!). Have a tasty holiday season!